The Smoke-EL (SmokeBlock) is designed for continuous usage. Therefore, smoke production is only limited by the size of your tank and your battery power. Additionally to this set you will need batteries and a tank for the smoke oil. 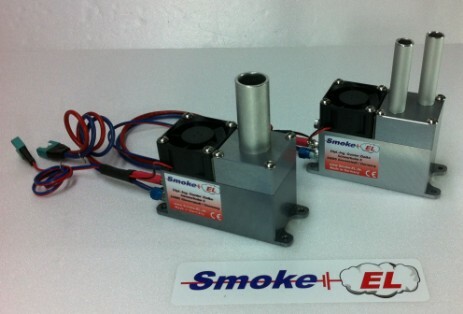 The Smoke-EL system (SmokeBlock) is powered with 12 volt and can be connected directly to the lead battery in your model. The SmokeDriver supervises the battery voltage and will automatically switch the SmokeBlock off if voltage falls below 9.9V. The SmokeDriver is connected to the receiver using a control channel. Using a Y-cable you can even manage the SmokeBlock and the engine control on the same channel. The built-in ventilator is linked to the revolution speed of your engine and will increase smoke flow accordingly. We offer our SmokeBlock with either one or two smoke stacks. And since people frequently ask: unfortunately, we do not offer black smoke. For an easy start with our Smoke-EL system, we put together a starter set that includes everything you need to use the Smoke-EL system, except for a tank and batteries.